Advanced Web Ranking is a cloud based service that allows you to track your ranking for keywords, web pages and social media campaigns. Advanced Web Ranking (AWR) was originally a desktop application, and you can still get this version to use on your own computer. For many users, however, it’s more convenient to be able to use a cloud based service that can be accessed from anywhere. In this review, we’ll be focusing on AWR Cloud to determine whether it provides good value and sum up all of the current Advanced Web Ranking discount coupons available, to save you a few bucks while you’re at it. Advanced Web Ranking is a well respected application used by more than 18,000 businesses worldwide. It is a web based rank tracker that gives you access to extremely accurate and up to date ranking results. This is extremely valuable for SEO purposes, as even small changes in ranking can indicate that a change in strategy is called for. Simple Rank Tracking -AWR provides accurate rank tracking for Google, Bing and Yahoo. You can get results for international markets, with rankings from over 50 countries supported. This is ideal for SEO firms that have customers all over the world. Social Media Integration -Find out how many shares you get from Google+, Facebook, Pinterest, LinkedIn and Twitter. Social media data is updated daily, with charts that indicate social share history. You can integrate unlimited Twitter and Facebook accounts with AWR and get real time updates. Local Ranking -Local rankings are essential for serving the needs of local businesses. With AWR, you get extremely targeted local rankings with place listings, local and maps results and city level ranking data. SEO Audit -SEO depends on a variety of factors, which is why it’s important to get a complete picture of where you stand. Run quality audits on AWR to get insights on issues such as meta and content tags, external and internal links, images and alt attributes and search engine visibility. Integrate With Google Analytics -When you combine the traffic stats provided by Google Analytics with the powerful rank tracking data you get from AWR, you get a complete picture of how your SEO efforts are working. Your ranking reports include traffic data and you can correlate rank metrics such as visibility score with traffic. Flexible User Management -People use AWR in a variety of ways and it’s designed to be as flexible as possible. You can manage unlimited clients and users and grant access privileges on a project by project basis. AWR is equally practical for small and very large businesses who may need to share data with team members (and you get a significant volume discount prices). White Label Reporting -AWR can be used to help you build your own brand. Create re-branded white label reports and personalized emails so that your clients will think that you have your own ranking software. Clients need never know that you are using AWR. Developer API – AWR Cloud API makes it possible to integrate client programs with AWR. Provides safe and secure SSL connections. Compatible with all programming languages. This lets you manage any number of large ranking projects at one time. Starter: $49 per Month. This is a good plan for individuals and businesses who want to use AWR for their own websites. 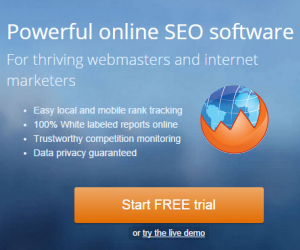 It lets you track 2,000 keywords and generate 100 reports. The Starter plan provides all of the features listed above, such as SEO Audit, Rank Tracking, Social Media and Analytics integration. It does not, however, give you Developer API. Pro: $99 per month. This plan is designed mainly for companies who are using AWR for in house SEO purposes. It gives you 7,000 keywords and 250 shared reports, as well as all other features except Developer API. Agency: $199 per month. This plan is designed for agencies who may have a large number of clients. You get 17,500 keywords and 500 shared reports, along with all other features, including Developer API. Enterprise: $499 per month. This is for larger agencies who need to manage large or many different projects. It provides 45,500 keywords and 1,500 shared reports and all other features. Larger custom plans are also available. You can get a 30 day free trial of AWR for all plans. All plans come with a 30 day money back guarantee. AWR provides volume discounts regardless of any other active coupon. You are getting a 5% discount for buying 2-4 licenses, 10% off for buying 5-9 licenses, 15% for getting 10-49 licenses, 20% for 50-99 licenses and finally 30% discount for 100+ licenses. I understand not too many of you are going to use that option, but be surprised, there are quite a few large SEO agencies out there. AWR Black Friday discount – Follow this link and use discount code BLACKFRIDAY to get 50%-70% off. Offer valid till Dec 1st, discount amount is reduced every day. Is AWR Cloud a Good Value? Advanced Web Ranking provides one of the most thorough rank checking services you can find anywhere. The type of tools that you get with AWR can be helpful in many ways. Whether you are a small business trying to rank your own site or an SEO agency, understanding your position in the search engines is crucial. There are several flexible plans that allow businesses to choose the solution that’s right for their needs. Anyone who wants access to the most powerful rank tracking services should give Advanced Web Ranking a try.